How do I set up a consultation? Dr. Thavamani D Palaniswami is a Paediatrician and Adolescence Care Specialist. She did her M.B.B.S at Kilpauk Medical College, Chennai and AB Paediatrics in USA. She has 14 years of long service in the major hospitals in United States of America. Her valuable work experience in the medical institutions of USA has empowered her skills in managing various medical and technical institutions. 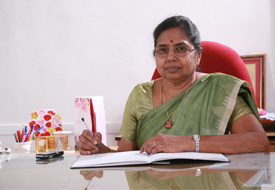 After assuming the position of Managing Trustee of Kovai Medical Center Research and Educational Trust, she is sharing the responsibilities of the Chairman in carrying out objectives of the trust in establishing and running various educational institutions on par with the best in the western countries. Her multi-dimensional approach makes the institutions excel in curricular and co-curricular aspects year by year. She believes that good education and discipline are the two inevitable factors in the development of the student’s community. Dr.Thavamani D. Palaniswami, is conferred the Life Time Achivement Award by Dr.M.G.R Medical University, Chennai. Dr.Thavamani D. Palaniswami, Vice Chairman of Kovai Medical Center and Hospital, Coimbatore, was conferred The Hindu’s ‘Women of the Year’ award . The award is to honour a woman of substance in commemoration of the International Women’s Day. © 2019 Kovai Medical Center and Hospitals.All Rights Reserved. This doctor appointment not available..!